Every decent dim sum teahouse tends to offer little bowls of mango pudding on the dessert menu, but I almost never order it. The problem is, the pale orange stuff generally referred to as “mango pudding” nowadays rarely turns out to be a celebration of one of Mother Nature’s all-time greatest hits. I mean, when made correctly this is little more than an inspired combination of dead-ripe mangoes and fresh light cream. 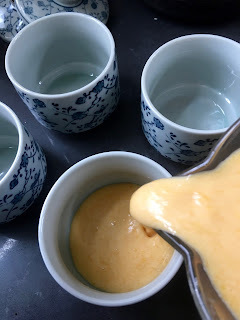 So, what you should be reveling in at the end of a dim sum meal or Cantonese banquet should be nothing less than divine, and when you look at the ingredients you'll realize that by all rights mango pudding ought to be awfully hard to mess up. Part of the problem is that most restaurants expect to serve this to the kids or to people who just want something on the order of ice cream for dessert. And so, the mango pudding we all get served will be cold, it will be sweet, and it will most likely be made from some mix with canned mangoes added and maybe a maraschino cherry on top, if the place really is trying hard. But that doesn't come near to the required simple perfection of this dish, which will transport devotees like me into a state of shivering ecstasy. No, for that I have to make a batch of mango pudding by myself. And I’m here to tell you how. And the good news is that it’s not at all that difficult a task, especially when you consider how much gratification is at stake, how short life is, and how few perfectly ripe mangoes we manage to enjoy in various iterations before we shuffle off this mortal coil. A great mango pudding should be a cool and fragrant bath for the senses. When made correctly, this luscious dessert offers a delicious cosseting for the tongue in between pillowy cubes of fresh, fragrant mangoes. This is, in short, heaven in a bowl. Like just about every other great dessert that I love, mango pudding was not designed with the kiddies in mind. Rather, this can and should be a dish of great sophistication, full of flavor, not too sweet, capable of surprise, and immensely satisfying, especially after a long and filling dinner. The one really important thing you have to do if you want success is get ahold of some very tasty, perfectly ripe, and not at all fibrous mangoes. 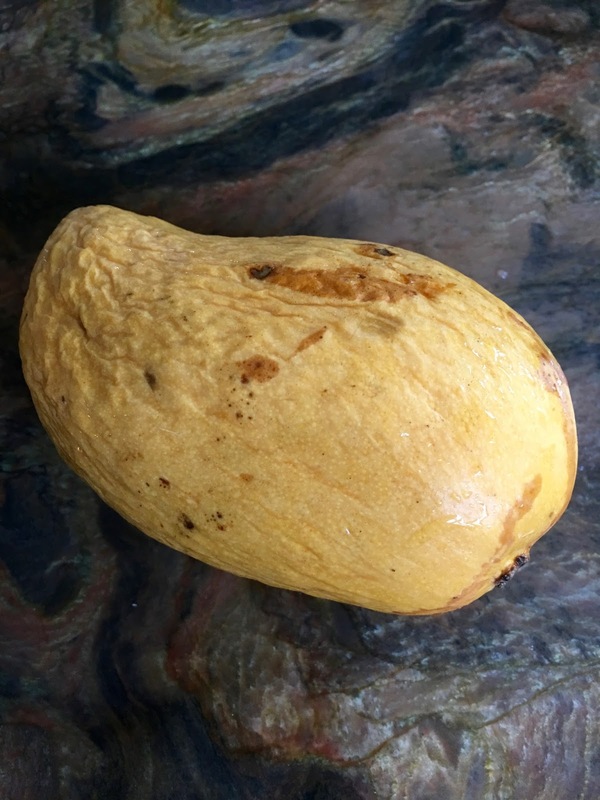 Right now is a good time in the Bay Area for Ataulfo or Manila mangoes, which are very aromatic, creamy, and relatively small. But any good mango will do. Learn to discern the varieties that you like (my other go-to mangoes are Kent and Haden, but that’s not at all a complete list) and keep an eye out for them, because this dessert requires careful planning. What you have to remember is that you almost never can get perfectly ripe mangoes in the market, as they bruise and squish so easily. Instead, hunt down delicious specimens that show great promise (I tend to lug home a whole case of the fruit in greedy anticipation of meals to come) and let them ripen away in the kitchen. When they start to smell fabulous and the skins are a bit wrinkled, give the stem end the very gentlest of squeezes to confirm that the mangoes are ready to be celebrated in style. 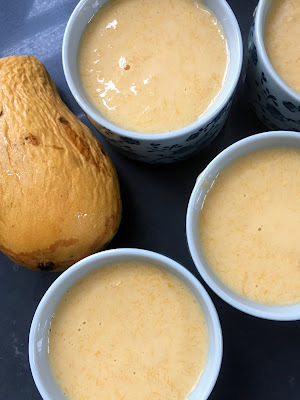 Mango pudding was probably descended from India’s mango phirni and was possibly introduced to Guangzhou (Canton) by the British, who had lots of fingers in a whole lot of colonial pies. Nevertheless, this has managed to become inarguably Chinese over the past hundred-plus years. And yet, in spite of this illustrious history, I really couldn’t leave well enough alone, now, could I? So, you get your half-and-half here instead of condensed or evaporated milk. You have a touch of sweetener instead of lots of sugar. You have way more mango in there than probably is legal in many states. And… I’ve slipped in some rum. You of course don’t need to include it if you’re serving this to children or other teetotalers. But it’s great with this little extra dash of fun. By the way, this is a fantastic dessert to serve after a fancy dinner at home because it can be made well ahead of time. All you need to do is add the garnishes and serve. 1. In a medium work bowl, sprinkle the gelatin over the cool water and let it soften while you prepare the rest of the ingredients. 2. Peel and pit the mangoes. Puree enough of the mangoes (about 2½ Alphonsos) in a blender or food processor to give you approximately 1½ cups (360 mL). 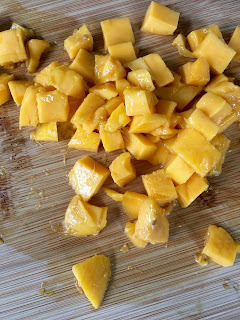 Cut the rest of the mangoes into small (½ inch | 1 cm) cubes. 3. Pour the half-and-half into a 1 quart (1 L) heatproof measuring cup. Microwave the half-and-half for a minute, stir, and then microwave again in short bursts until the liquid is very hot but not boiling over. Stir the softened gelatin into the hot liquid and swish things around gently with a small whisk until the gelatin is dissolved. Then, stir in the mango puree and either the rum or the agave syrup. 4. Divide the pudding among 4 (1 cup | 240 mL) dessert bowls and chill for about an hour, by which time the pudding will have thickened a bit. Reserve a couple tablespoons of the cubed mango for garnish, if you wish, and then divide the rest among the bowls, stir very gently to mix in the fruit, and refrigerate the pudding for at least 2 more hours and up to 3 days. Serve chilled with a small puddle of half-and-half on top, as well as a couple of mango cubes and a small mint sprig stuck into the edge to snazz things up.